If you’ve been on our website recently, you might have noticed that we have 4 different versions of John MacArthur’s Study Bible. And. if you know our app well enough, you may be confused as to why we have this same resource available with different translations. In the app, we let you use any Bible translation you want with a study Bible. Why would you need this one with NIV instead of ESV? Well, in each of these resources, MacArthur makes direct reference to specific translations. 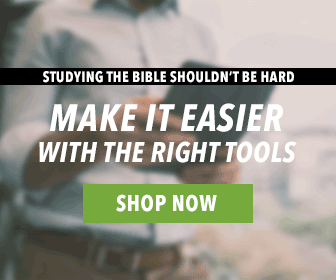 You can still mix and match study Bibles and translations all you want—but if you prefer the NASB, we definitely recommend getting that version of this study Bible! Now, check out this snippet from MacArthur’s Study Bible. The English word “gospel” derives from the Anglo–Saxon word godspell, which can mean either “a story about God,” or “a good story.” The latter meaning is in harmony with the Greek word translated “gospel,” euangellion, which means “good news.” In secular Greek, euangellion referred to a good report about an important event. The four gospels are the good news about the most significant events in all of history—the life, sacrificial death, and resurrection of Jesus of Nazareth. The gospels are not biographies in the modern sense of the word, since they do not intend to present a complete life of Jesus (cf. Jn 20:30; 21:25). Apart from the birth narratives, they give little information about the first 30 years of Jesus’ life. While Jesus’ public ministry lasted over three years, the gospels focus much of their attention on the last week of His life (cf. Jn 12–20). Though they are completely accurate historically, and present important biographical details of Jesus’ life, the primary purposes of the gospels are theological and apologetic (Jn 20:31). They provide authoritative answers to questions about Jesus’ life and ministry, and they strengthen believers’ assurance regarding the reality of their faith (Lk 1:4). Although many spurious gospels were written, the church from earliest times has accepted only Matthew, Mark, Luke, and John as inspired Scripture. While each Gospel has its unique perspective, Matthew, Mark, and Luke, when compared to John, share a common point of view. Because of that, they are known as the synoptic (from a Greek word meaning “to see together,” or “to share a common point of view”) Gospels. Matthew, Mark, and Luke, for example, focus on Christ’s Galilean ministry, while John focuses on His ministry in Judea. The synoptic Gospels contain numerous parables, while John records none. John and the synoptic Gospels record only two common events (Jesus’ walking on the water, and the feeding of the 5,000) prior to Passion Week. These differences between John and the synoptic Gospels, however, are not contradictory, but complementary. Each Gospel writer wrote from a unique perspective, for a different audience. As a result, each Gospel contains distinctive elements. Taken together, the four Gospels weave a complete portrait of the God–Man, Jesus of Nazareth. In Him were blended perfect humanity and deity, making Him the only sacrifice for the sins of the world, and the worthy Lord of those who believe. 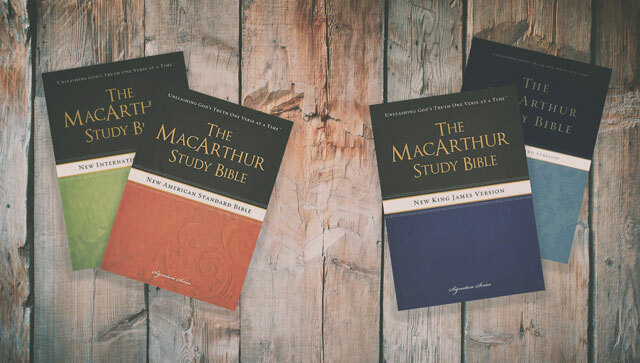 There is so much more to MacArthur’s study Bible than what you read here. To get a full picture of all the insight you can gain with the resource, head on over to our website by selecting a link below. Only the King James version of the bible is the holy grail of God’s word. The rest are counterfeits! Most of the KJV WAS the work of William Tyndale and before 1607 where was the Holy Grail it was in the accumulated greek manuscripts, and the Book of Revelation was pulled from the Latin Vulgate, so with more time and more texts scholars can compare and todays language can be easily understood by todays culture in 2018 vs 16th century Elizabethan English. Agreed. If it was good enough for Paul its good enough for us.